It was a new day and time for a new burger. This time I was leaving the confines of Jackson, Madison, and Flowood for the wilds of Byram. Outside of trips to New Orleans, I rarely venture that way on I-55 but rumors of a new burger restaurant were too tempting to ignore. In a small strip mall, next to Krilakis, in what was once the home of Stamps is Geaux Burger Grill. Geaux Burger isn’t a large restaurant. With little more than three tables and a counter, it fills quickly. 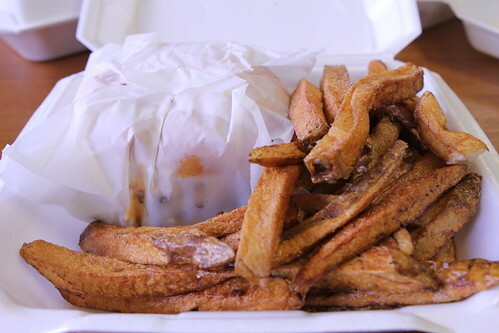 When you step up to the counter to order, there are a variety of “mo’ durvs”, po-boys, burgers, and baskets, but you soon realize there are really two camps to choose from, grilled or fried. While the starters, baskets, and po-boys are all enticing, I came to Geaux Burger for the burgers and that’s where I started. First a little background on the burgers. 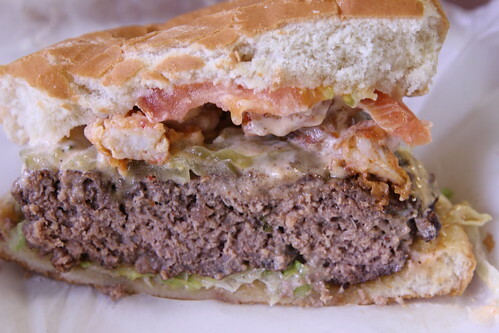 There are only four choices on the burger section of the menu: the Geaux Burger, the Bayou Burger, the Bourbon Burger, and the Mud-Bug burger. Each one is a half pound of choice ground beef. 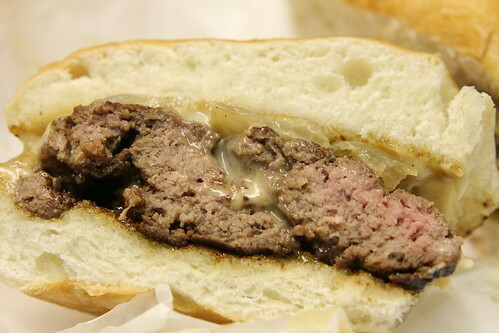 There are not any special cuts to a Geaux Burger, this is pre-ground beef from a tube that is, by default, cooked well done. However, Geaux Burger will cook burgers to order and I highly recommend toning it down to at least medium doneness. With those details out of the way, let’s take a look at what these burgers had to offer. Per recommendation, the Mud-Bug Burger was my first burger to try. 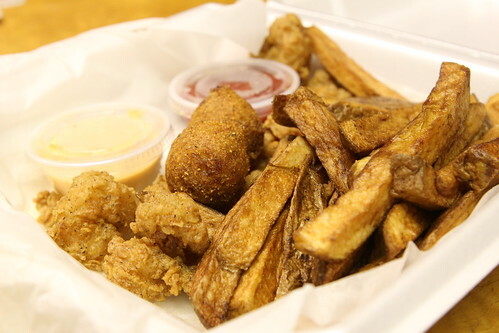 If you like French fries, then Geaux Burger is the place for you. 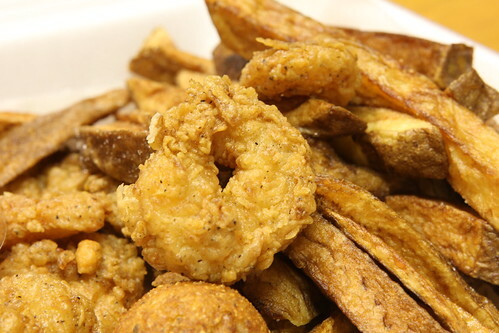 Nearly every order comes with a healthy, family sized serving of French fries. Homemade and thickly cut, these are well salted fries. They aren’t particularly crispy but they have their own fluffy virtues. 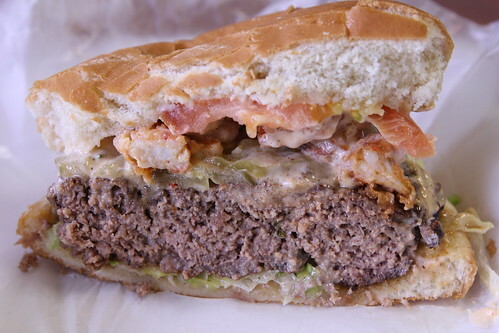 Loaded with lettuce, pickles, Cajun mayo, homemade remoulade and fried crawfish tails, the mud-bug burger is, from the first bite, an overwhelmingly salty burger. While the combination of mayo and remoulade may have been too much for one burger, it was the patty itself that was the biggest worry. Cooked well done, this patty was missing any real beefy flavor or juiciness. This burger was ordered before I knew Geaux Burger’s policy. After this, all of my burgers were ordered to a medium doneness. A few weeks later, I was back at Geaux Burger to see if their cooked to order burgers had any more potential. This time, I started with the basics, the Geaux Burger. 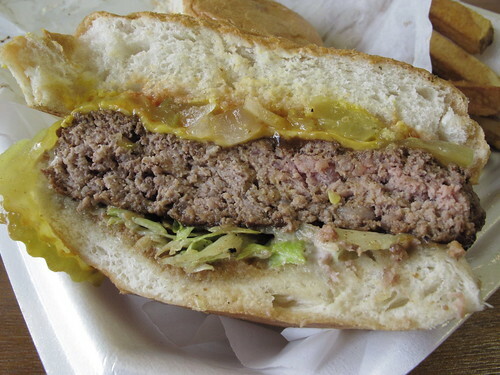 A half pound of choice ground beef is grilled and dressed with lettuce, pickles, onions, mayo, ketchup, and mustard. Tomatoes are standard but I opted to leave them out. Pre-ground tubes of meat or not, this was a vastly improved burger. Yes, it didn’t have the pleasantly pink middle of a medium patty but this was juicier, beefier, and an all around better burger. Last for me was the Bourbon Burger. 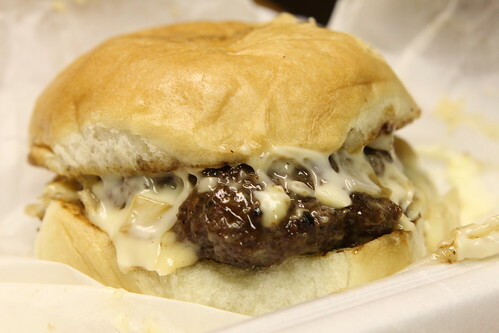 It arrived smothered in Monterey Jack, caramelized onions, and homemade bourbon sauce. 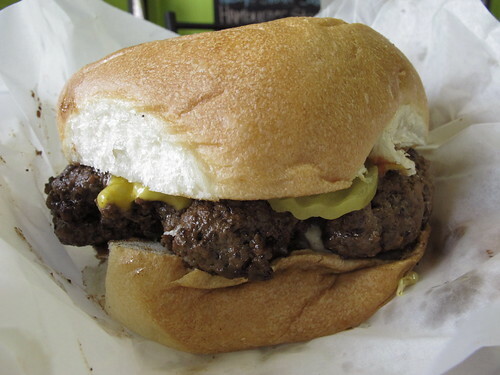 I’ve failed to mention it before now, but Geaux Burger Grill uses an oddly sweet bun. Usually, it’s not an issue but when combined with the caramelized onions and sugary bourbon sauce, it was too sweet to handle. 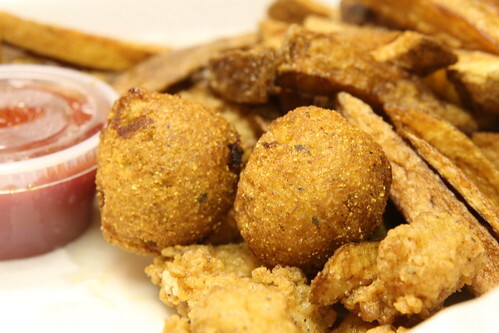 As for the rest of their menu, it’s your usual assortment of stuffing choices for the po-boys. Catfish, chicken, shrimp, oysters, but I was interested in their Bayou Cadillac. 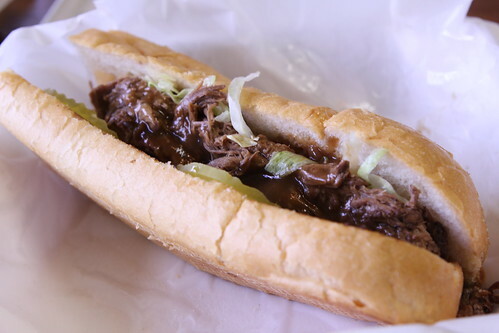 Essentially Geaux Burger Grill’s take on the classic roast beef po-boy, it arrived on Gambino’s bread and dripping with gravy. I quickly found out why. 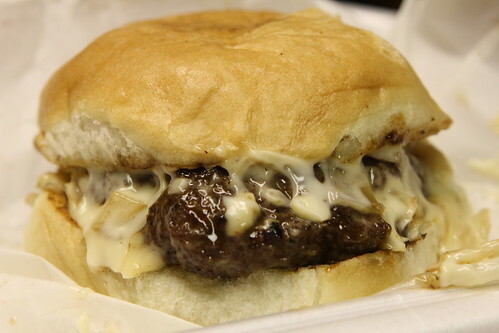 Thankfully, Geaux Burger has learned the lesson, if you’re going to serve dry, overcooked roast beef, cover it in gravy. One thing they haven’t learned is the virtue of condiments. 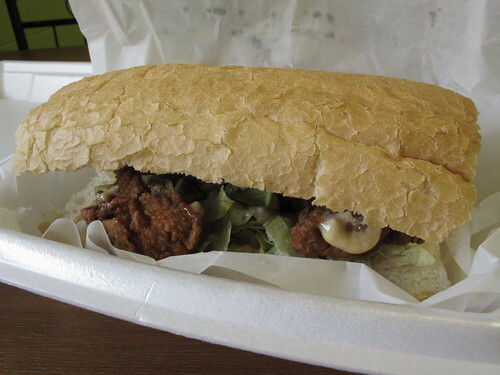 It was only after requesting salt, pepper, and a small cup of hot sauce, that this po-boy reached its true potential. 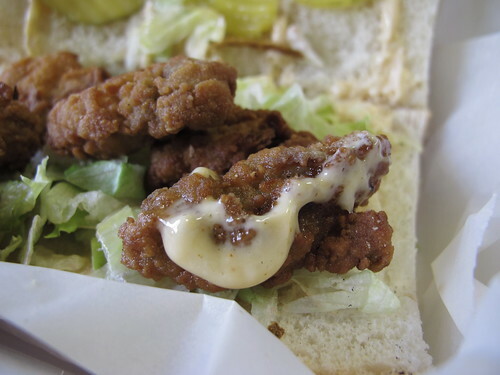 To see how Geaux Burger would handle another traditional po-boy, the oyster po-boy was next. It looks good from the outside. 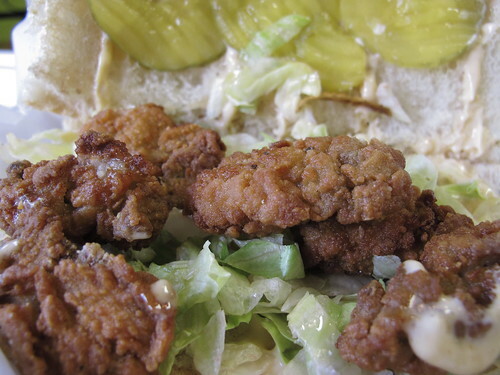 A peek inside reveals six, large oysters on a fully dressed po-boy. Well, there were six, but I had to try a solo oyster. These oysters were up to the task. Fat, juicy, with a thick and crunchy exterior, they were lightly salted and full of their own natural brininess. 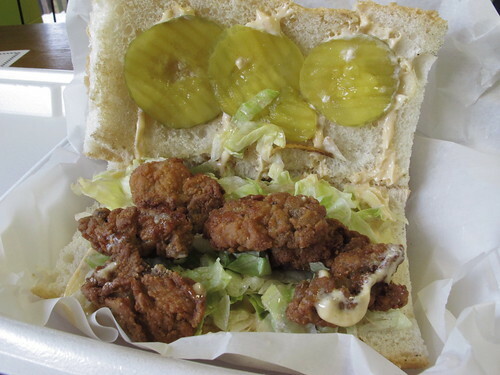 Combined with the dressed po-boy bread and the requested hot sauce, this was a fine oyster po-boy. Not wanting to ignore the baskets section of the menu, I skipped the catfish and chicken strips and went straight for the fried shrimp. More French fries, a few hushpuppies and the obligatory ketchup and remoulade round out the Styrofoam container. While the dozen shrimp may have had a fairly pleasant crispy exterior, it was the initial saltiness and the finishing flavors of pepper and old fryer grease that really stood out on these shrimp. Surprisingly these unpleasant flavors were highlighted by the ketchup but mostly mitigated by the remoulade. Sadly, that’s the way I left Geaux Burger Grill. There were some moments of satisfying brilliance, e.g. 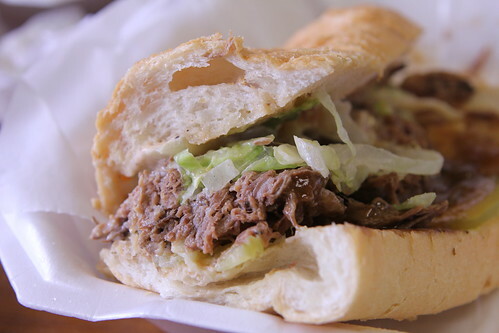 the oyster po-boy and some pretty fair sandwiches, but for the most part it was a mixed bag. Concerning their namesake, once they stopped cooking the burgers to death they weren’t too shabby. I do wish they would tone down the excessive toppings but these were simple burgers and, on the whole, they are a fair option for your burger cravings.